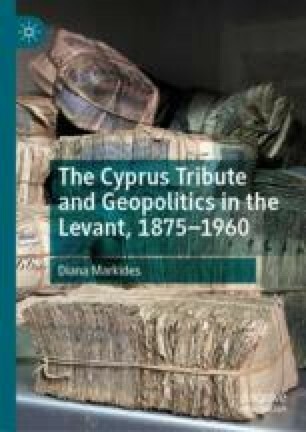 This chapter will explore in some detail the interaction between the positions taken on the tribute issue by the Cypriots and their colonial administrators, and political and constitutional developments in the island. In doing so, it will consider the significance of the constraints on the British government created by their simultaneous political and financial confrontations with the Egyptians in the 1920s. Both territories had been exempted from a share in the Ottoman public debt as it stood after 1914 because of their commitments to earlier Ottoman debts, Egypt explicitly and Cyprus, it was argued by the Treasury, implicitly. Moore, Lyndon, and Jakub Kaluzny. 2005. Regime Change and Debt Default: The Case of Russia, Austro-Hungary, and the Ottoman Empire Following World War One. Explorations in Economic History 42: 237–258. www.sciencedirect.com.